From House of Cards' Freddy Chef's Carl Casper to Eat Drink Man Woman's Chu, these are the best live chefs to ever hit the screen. In the pantheon of film and TV, many, many stories focused on, or at least featured, food. While the chefs making said food might not always receive the same spotlight as the creations themselves, a number of fictional chefs have appeared on screens big and small and truly excelled in their roles. 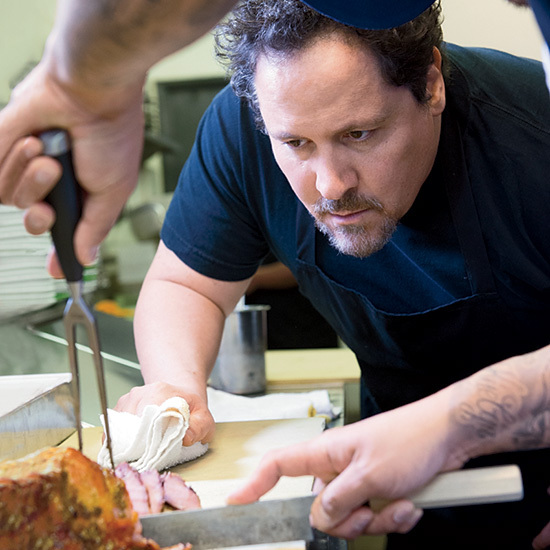 While there are a ton of great animated chefs from film and TV history, along with a great number of documentaries focused on important chefs, here we’re simply referring to actors who exhibited both skill and realism in their portrayals. Here are the nine best live action film and TV chefs of all time. Babette’s Feast is a strange movie with a strange premise, but the cooking scenes are some of the best ever filmed. When Babette asks to cook a French meal for the elderly sisters she’s been taken in by, along with most of the town, the locals are a bit weary of what might happen (it’s 1800s Denmark, everything was scary). What results is an exquisite multi-course French feast, which includes both caviar and bundt cake. Why? Because Babette says so. Pastry chefs are sometimes overlooked in discussions of the great chefs of today (unless you’re Dominique Ansel or Christina Tosi, of course). However, Juliette Binoche’s Vianne Rocher from Chocolat demonstrates a great amount of skill and ability in running her chocolate shop. Rocher offers a wide range of chocolates, pastries and truffles, while operating completely on her own. While not a requesitie for a great chef, she’s also astute at guessing her customers’ tastes and offering them advice on their love lives. What more could you ask for from your local chocolatier? There a lot of great cooking scenes in Chef, all of which were composed under the watchful eye of chef, and movie consultant, Roy Choi. However, the pasta scene featuring Scarlett Johansson (seen above) is unmatched. Between the knife skills, proper seasoning and plating technique, that bowl of pasta is enough to make anyone know that they are in very good hands when this chef is cooking. There are movie cooking scenes and then there is the opening scene from Eat Drink Man Woman (seen above). Chef Tao Chu prepares the Sunday meal that he shares with his daughters every week and the skills displayed, from killing and preparing the fresh water fish to breaking down vegetables to any number of other techniques he displays with the use of a simple cleaver, are startling. While Frank and Freddy's relationship didn't end on a high note, there was an earlier, simpler time when Frank simply hid out in Frank's BBQ joint and enjoyed some morning ribs. Freddy always claimed that he liked to keep things simple when it came to his meat, which was one of Frank's favorite things about both the food and Freddy himself. However, Freddy and Frank seemed to share a lot of similar sensibilities as well, which can be seen in the scene above. In Big Night, Tony Shalhoub’s chef Primo is a chef from a different era, an immigrant who came to America with a simple dream of making rustic Italian food and was met by New York customers asking for spaghetti and meatballs. Seriously, if chef Primo popped up today in Brooklyn, his restaurant would be the talk of the town/Internet. The dish that sets chef Primo apart is timpano, the monsterous baked pasta dish that arrives during the movie's climactic scene. As chef Primo says, “To eat great food is to be close to God. I’m not sure what that means, but I know it’s true.” Amen chef, amen. Technically speaking, Julia Child was never an actual restaurant chef. However, no figure in American culinary history has inspired and taught more people to cook than she did. Meryl Streep's portrayal of Child in Julie & Julia is spot on and while most of the cooking scenes in the movie focus on Amy Adam’s Julie rather than Child herself, the skills Child displays when she does cook are truly stupendous and show how the woman who would soon teach America to cook got her start. While Spanglish doesn’t include a ton of cooking scenes, there is one that does a great job of informing us of what kind of chef Adam Sandler’s John Clasky probably is rather than seeing what he actally does in a professional kitchen. While there is nothing inherently complex about the sandwich seen in the clip above–it’s basically just a really nice BLT with a fried egg on top–this tells us that Clasky is probably making delicious food at his restaurant, simply because when he makes a meal for himself, he keeps it simple, but decadent, with just this sandwich and an excellently poured beer. It's almost a shame that many of the most beautifully constructed cooking scenes in recent television memory involved human organs and muscles. Mads Mikkelsen's Dr. Hannibal Lecter is as meticulous cooking parts of his victims as he is in disecting them and as a result, the kitchen scenes from Hannibal are truly extraordinary. Luckily, he mostly cooks for himself, which might seem lonely, but is probably for the best. Alright so Burnt has plenty of issues, including the crime-ridden side plots and the romanctic tie-ins. However, from just a chef and food angle, Burnt, along with Bradley Cooper’s chef Adam Jones, does not disappoint. Jones’ sole focus is getting three Michelin stars and the kitchen environment he creates during that pursuit is essentially a ticking time-bomb built on stress and heat. However, the impeccably plated dishes that result are proof that sometimes being the best does require a chef to embrace his inner Gordon Ramsay more than he’d like.